issued palm fronds to wave as we marched around the sanctuary and gathering room singing. Our return to the pews was followed by a stirring and meaningful number from the enthusiastic adult choir. Then it was showtime as Pastor Trey and several church members assumed the role of key characters from the Passion story with responses from the audience and hymns mixed in. All in all, a most meaningful service followed by Communion. Now, it was not the drive-by Communion this time but the real deal where we actually all go up in groups and kneel at the altar to receive the sacraments. I used to prefer this option but that was before my knees grew old, tired and unwilling to support the weight of my mass without letting me know in no uncertain terms..this is gonna hurt. Considering the pain our Lord suffered, I’m a little ashamed to admit my concentration on the meaning of the moment can be clouded with thoughts about what will I do if I can’t rise to my feet after Pam disperses the little cup of Christ’s blood (Mogen David wine) given and shed for me. But it was all good and, like I said, the readings were first rate. I’m always moved at the part of Jesus’ crucifixion where one of the two thieves being put to death at the same time feels remorseful and says so. He then receives assurance from the dying Savior, that, indeed, the thief would join Him that day in paradise. That seems to supersede all other biblical requirements and gives real hope to those of us who often figure we can never measure up to the demands of salvation. On the way home, I was still filled with the spirit and decided to let others know it was Palm Sunday by sticking our fronds out the car window and waving them at others driving down East 10th street. I was hoping to get a few honks of approval from my fellow motorists but most just smiled or looked really puzzled as they passed by. 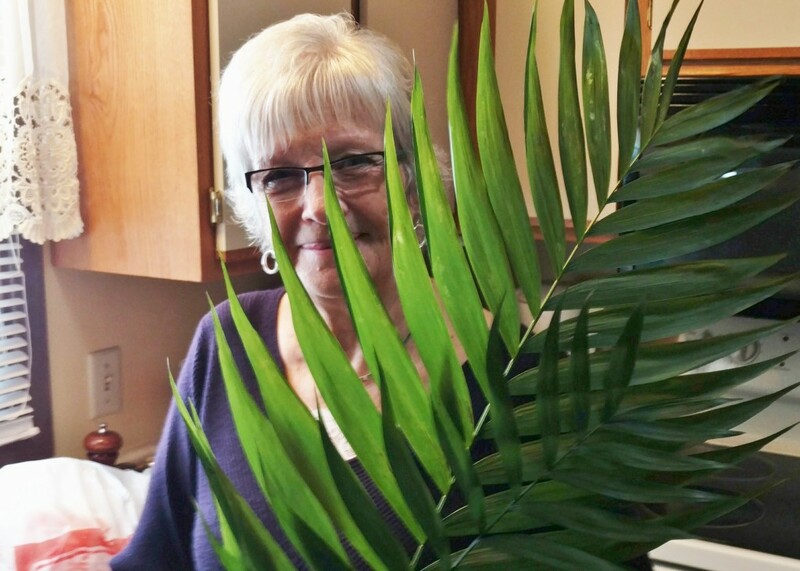 Linda sort of sunk down in her seat at my spontaneous calling to evangelize Sioux Falls traffic…and, even though it’s Spring and Easter tide, my un-gloved hand nearly froze..so I brought the tropical foliage back in the warm car feeling satisfied I’d suffered enough for the Lord this day. What a frond we have in Jesus. A very Happy Easter Season to you and yours. That’s a whole new idea of evangelism. ✝️ Reminds me of the time you decided to “cruise the loop” with us kids in the car – so embarrassing. Too bad you didn’t have a palm frond then. You really might have saved some souls!